Eugenie is going to Ho Chi Minh City. Travelers are voting Ba Dinh Square as the best plaza and square in Hanoi. You can find 1 plaza and square in Red River Delta and 2 plazas and squares in the country of Vietnam. Ba Dinh Square is the top pick in Vietnam. Want more? 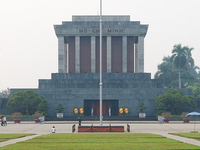 Check out our map of plazas and squares in Hanoi.